Ron Hornaday is winding down the current chapter of his storied career in the NASCAR Craftsman Truck Series, and quite frankly, the two-time and defending series champion from Palmdale, Calif., is disgusted with the current state of affairs. Hornaday, in the process of falling 218 points behind archrival Jack Sprague in the standings, has not won in the last 11 races -- the longest winless drought in his five-year career in the trucks. Worse yet, he has only one top-5 finish in the same stretch of races. "This team is fighting to turn it around, but we can't catch a break," said Hornaday, who has wrecked strong trucks in his last two outings. "We will not give up and we will turn it around." Even though his experience is minimal at Michigan Speedway, the site of Saturday's goracing.com 200, the 16th race of the 25-race season, he's looking for any little advantage he can get in the NAPA Auto Parts Chevrolet. Hornaday will scratch and claw for every hundredth of a second he can find in some two hours of practice on Thursday, leading into Friday's Bud Pole Qualifying session that will set the field for the race. Hornaday's last victory came in the circuit's 100th race, at Evergreen Speedway on April 10. At that point, Hornaday had won two of the first three races this season, but since then, he has fallen to sixth in the standings heading into the 200-mile test on the two-mile speedway with 18-degree banked corners. Hornaday is nowhere near daunted by the series' first visit to its longest oval venue in its history. "This place is awesome," Hornaday said. "It is a smooth surface with only a couple of bumps coming off of Turn 4. It is really fast. A lot of people say that is just like California (Speedway), but it's not. The banking here is steeper, so you can drive into the corners deeper than at Fontana." Michigan would be a good place to start a turnaround, as it's in the manufacturers' back yard, so to speak. 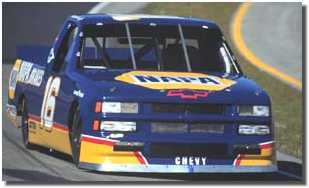 Hornaday also is one of a small handful of drivers in the series who has any experience on the track. A few years back, Hornaday attempted to qualify for a NASCAR Winston Cup Series race at Michigan in the Racing for Kids Chevrolet owned by Dale Earnhardt. Hornaday brushed the wall in Turn 3 during qualifying and failed to make the race. "We had a pretty good car," said Hornaday, who will move to the NASCAR Busch Series Grand National Division in 2000 with DEI in a NAPA-sponsored car, said. "Michael Waltrip practiced the car some to help us setup wise because I hadn't been there before. I kept telling Michael that it was loose. "He said it was perfect, but I was half-a-second faster than him in practice. So we didn't change anything and I drove it into three and she broke loose. I came back in and said, 'I told you it was loose,'"
Hornaday's transporter will unload truck No. 10. It has yet to be named and is the newest superspeedway truck in the DEI fleet. It is the same truck the team took to Texas Motor Speedway on June 11. During that event the truck was the fastest during the race and nearly led the most laps before running out of fuel. Although Hornaday is in charge of naming the trucks, the team has nicknamed it "Thirsty," for obvious reasons. Hornaday knows that might be a factor, but it doesn't hurt his confidence any, particularly in his engine builder Ron Hutter. "In the Winston Cup races here it always comes down to fuel mileage, and I think it will for the trucks as well," he said. "It is such a wide track, so you have plenty of room to pass. When you have cautions here they are usually because something broke, not because of contact with another vehicle. If you don't have a bunch of cautions, then it's all green flag racing and the draft can either help your fuel mileage or hurt it. "You have to have a great motor here. If you don't have the motor, you better hope everyone runs out of gas, because you don't have a chance. These Ron Hutter motors are awesome and I'll put my horsepower up against anyone."